Limonene is a multi-purpose alkaline detergent that has been developed for the professional exterior house washing industry and the environment friendly consumer. The citrus solvent extracts in Limonene is an incredible workhorse when it come to removing carbonaceous pollutants, acid rain as well as mold and mildew . Limonene is a superior performer in the exterior house washing industry. It can also be useful for a variety of other cleaning applications. For the absolute very best results downstream inject using the Allison Super Suds Sucker (p/n 1964). 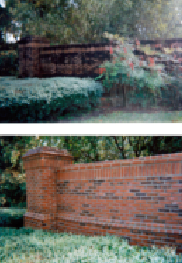 To the left is a before & after picture of a brick wall cleaned with Limonene. The product was applied using an Allison Super Suds Sucker Injector. Packaging: 40 lbs. of powder and 1 gallon of liquid activator.